Noble Publishing has been going down hill for some time, and this continues to be the case. CEO, Jean Marc Philippe Gombart, has a reputation with authors somewhat less favorable than mud. Kari Gregg reports an ridiculously inept paperback release, at 11x9 inch size and basically not formatted at all. On top of that, their new release schedule has become very sparse. There is also an interested email chain from which I pulled the quote shown below. Brita Addams summarizes many issues including the publisher demanding that the author pay postage for their author copies. This kind of nickle-and-diming of authors suggests a publisher that is either completely broke or more than a little spiteful. Margie Church is one of many who suspect royalties might be under-reported and so under-paid. I almost always disregard this sort of claim, but in this case it seems plausible. Books who were steady earners suddenly slowed to a trickle. Books higher in vendor rankings than other titles by the same author (with a different publisher) are reported as having few sales. It is suspicious. Basically, the more you look, the worse it gets. I am not sure what Gombart hopes to achieve by refusing to release authors. Because this tail spin ain't gonna be turned around. I also suspect their royalties may be on more "autosend" then actually calculated. I know one author who hasn't been with them for months, yet still gets a 0 sales royalty statement every month. Seems like it's on auto-dial or at least one person doesn't talk to anyone else in the company. Thank you so much for helping us to spread the word about this horrendous company. Love the graphic. I think I will cop it. I can't complain about not getting royalties,(There is enough to complain about!) but the statements are a little less than nothing. I plan to audit my records in October, and despite numerous notices, Gombart still hasn't replied to my notice. My last report showed that I had two books sold in the past month, still have to wait a bit till it reaches the $25 point when they'll be sending it out. I guess that's how it goes. I caution every author not to submit to Noble. They put up my book with zero editing. That's an embarrassement to me. From a report I saw, I sold over 50 copies in March 2012 in Amazon Germany, but Noble says I didn't. They owe me money. I tried to get my rights back due to the money owed me and the non-editing of my book, but Gombart refused. He did offer to have another editor edit it, but I refused. I don't want Noble touching my book. 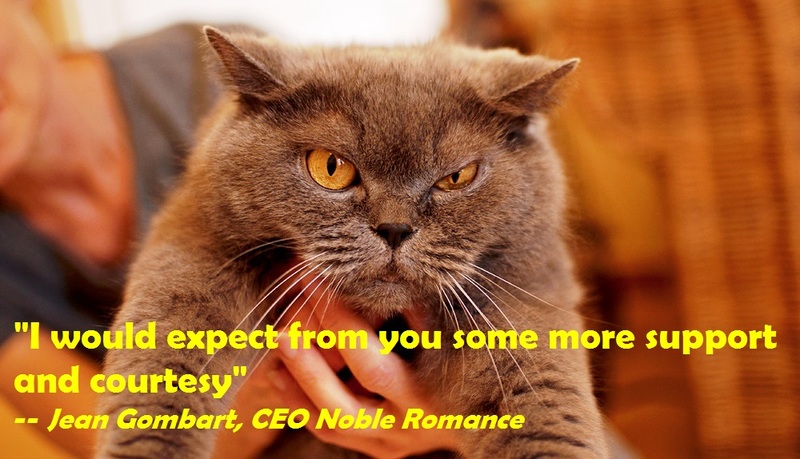 Worst writing mistake I ever made was to sell to Noble. Stay away from them. A response to Mick. I earned back my advance fairly quickly. Now the sales have trickled which is fine with me. I hope the sales stop entirely so I can get my rights back. I don't know why you have to wait for your money. I've been selling one to two books a month on Amazon, and Noble has paid me, only $1.47 per month, but they are paying me. It's not normal to wait for your royalties. Noble is snowing you. No, I got $50, two books, when I first submitted them but now I wait for the very slow royalties. I suppose it will take some time for it to get there. Mick, I just realized you mean your advance. I got a $100 advance and earned that back in the first 2 months. I'm thankful I negotiated from a 7-year contract down to 4 years. If they don't go bankrupt before Dec. 2014, I'll get my rights then. And I'll have it edited by someone who knows how to edit. Early on, Jill, who's since left, began ignoring my emails. I emailed her three times to get my book on BN Nook. When she finally did, she never told me and I found out by accident. I've had books with another epub that is a class act. They're editing is great and the owners and editors always, always, respond quickly to emails. Noble is not a class act. Thank you for helping us spread the word that this is not a publisher authors should submit to. I have heard nothing from the company regarding my requests for the reversion of my rights. The latest request for an audit on one of my statements is "being reviewed." We are hoping for a swift, honorable resolution. But then, we've been asking for that for a long time. - gets rude, patronizing and simply nasty. I have never seen a publisher throw a tantrum like that. My five-year-old would be ashamed. To be honest, I wish I'd burned my draft rather than send it to them. Top to bottom its a disgrace and a shameful performance from everybody in the company. My experience with them has been the worst of all my publisher experiences, a nightmare from start to finish - laughable editing, formatting which entailed me insisting that the entire book be reformatted and reprinted (one of the errors was that the spine words were the wrong way up!) and sales? what sales? the book has never made its advance back despite having the talent of Charlie cochrane within its pages, the royalties monthly are less than five dollars, which is laughable. I've been attempting to get my rights back since Jill left and despite one initial communique with Gombart - where he did call me in the UK and reassure me that he would do everything to help boost sales - his promises were never met - he did nothing to market the book, didn't put it on the 3rd party sites that he said he would. and has since ignored every single email and message I've sent him. Luckily the contract runs out soon, it can't come soon enough for my liking. What a shambles and I feel sorry for people who are tied in for more than one book. You may add my voice to the list. I am prominently listed on Piers Anthony's HiPiers.com as one of the complainants against Noble Romance Publishing, and have just published a post at my blog (http://jswayne.wordpress.com/2013/05/02/silence-does-not-equal-consent/) concerning the substance of my issues. What triggered this was learning that Gombart is now claiming I am on friendly terms with Noble, all is forgiven, et cetera. I assure you this is not the case. I have been offered a contract by Noble Publishing and I have read a lot of negative stuff about this company. Problem is, I can't understand what the company is doing except refusing to let authors of their contracts, which at least in my experience in other industries, is nothing unusual. I understand people don't like the CEO. Is that reason enough to trash the entire company? I understand how people can be angry that they are stuck under contract. I've had the same experience myself. But the authors are the ones who signed the contracts. If there is anything of real substance wrong I'd like to know what it is.